The basis of GPIW’s work is the dynamic expression of unity, emerging from the heart of wisdom of the world’s spiritual traditions, and our own hearts, into a community. We believe this narrative can help animate social and economic structures and systems that better reflect humanity’s natural evolution toward greater wholeness. An essential part of this shift is the coming into a balanced and sacred relationship with the earth and all living beings. Feminine wisdom and the power of love can serve as the fulcrum for this inner and outer transformation. In 2016 The Global Peace Initiative of Women (GPIW) launched a series of global dialogues between emerging leaders working in the environmental field and spiritual mentors on the theme of the Inner Dimensions of Climate Change. With the support and partnership of Dharma Drum Mountain Buddhist Association (DDMBA) and with the collaboration of Earth Charter International, this series of global gatherings is designed to enable young leaders to see the climate/ecological crisis through a spiritual lens, to explore the broader implications of the serious changes we are causing for the earth community. Our hope is that through these gatherings these young people will come more deeply into the recognition of the sacredness of the world around us, and awaken from within a love for the natural world. This, we hope, will inspire and guide their work going forward. Below you will find highlights from the first two programs. One features a gathering of 22 young ecologists from 14 countries in Africa who came to Marrakech during COP22, and the second gathering brought together 25 young leaders from 15 countries from the Americas and the Caribbean. We were humbled by their depth and awareness, and the commitment with which these young people are working for the planet and for their communities. GPIW emerged from the first World Summit of Women Religious and Spiritual Leaders at the Palais des Nations (United Nations) in Geneva in 2002, a summit convened in response to the lack of women in the ranks of world spiritual and religious leadership. GPIW was founded to provide faith leaders with a forum to engage in causes for social transformation and to provide women in this sector with a strategic network to support and advance their efforts. As this work has developed, we found that many men supported and sought to further this mission, and they began to join GPIW gatherings as welcomed colleagues. In its early years, 2002 to 2008, GPIW convened gatherings with communities in Palestine and Israel, Sudan, Iraq, Afghanistan and Cambodia with the goal of uncovering the deeper origins and impacts of conflict, and to learn how best to address these. Findings from this work revealed that the root causes of conflict, and its solutions, often begin with shifts at the personal level — the inner and unseen changes in heart and mind. 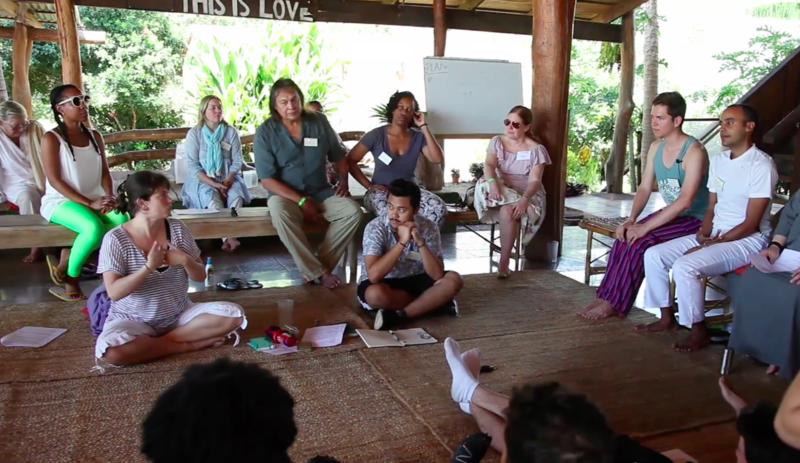 With this awareness, we began to facilitate this process through intimate dialogue exchanges, and activities such as meditation, indigenous healing practices, centering prayer and yoga, seeing these forms as a beneficial way to further the cause of collective peace through personal transformation. From 2009 to the present, we have focused our attention on bringing GPIW’s inclusive and spiritually-based model to bear on the pressing global ecological and economic crises, as we see these as inextricably linked to the possibilities for a balanced world. Through such programs, we seek to further refine and act on the ways self-awareness and social awareness, as well as integration, can serve as a pivotal fulcrum for societal transformation. As a convening entity, the Global Peace Initiative of Women goes where we are needed and where we have been called. We work in receptive, responsive and ever-evolving ways.